A look at the scene of a crash at Letogo on Sunday afternoon. 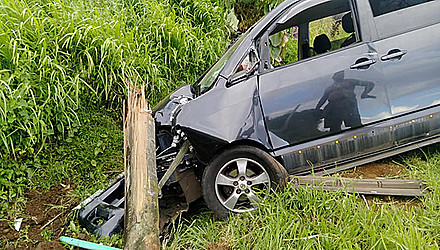 The driver of this minivan lost control of the vehicle, veered off the road crashing into a telephone pole before it eventually rested in a ditch. The Police arrived immediately. Alcohol is suspected. The driver and his passenger suffered minor injuries. Photos: Nynette Sass Facebook.